Loviisa is a municipality and town of inhabitants on the southern coast of Finland. 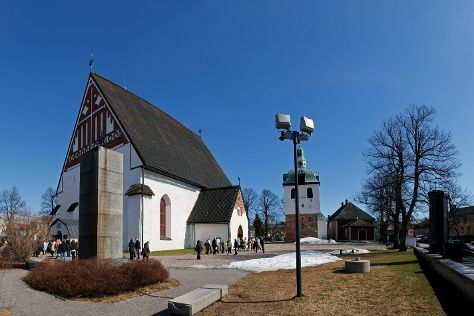 Get some cultural insight at Cathedral of Porvoo and Orthodox Church Porvoo. Deepen your sense of the past at sights like Castle Hill and Loviisan kirkko. Explore the numerous day-trip ideas around Loviisa: Porvoo (Porvoo Old Town, Fredrika Runebergs Park, & more). The adventure continues: get some fabulous bargains at Brunberg Candy Factory Shop, take in the waterfront at Laivasilta, look for gifts at Riimikko, and take in the pleasant sights at The Devil's Stairs. To find other places to visit, where to stay, maps, and other tourist information, go to the Loviisa road trip website . London, UK to Loviisa is an approximately 8.5-hour flight. You can also drive. The time zone changes from Greenwich Mean Time to Eastern European Time, which is usually a 2 hour difference. Expect a daytime high around 23°C in August, and nighttime lows around 13°C. Finish up your sightseeing early on the 13th (Tue) so you can travel to Helsinki. Do some cultural sightseeing at Rock Church and Uspenskin Cathedral (Uspenskin Katedraali). Get some historical perspective at Sea Fortress Suomenlinna and Helsinki Cathedral. 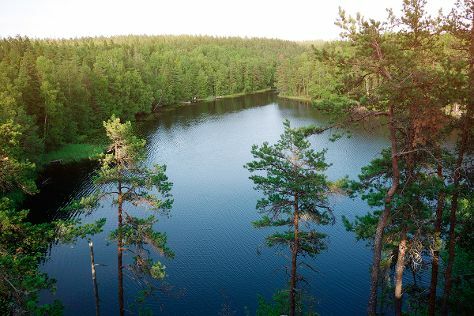 Change things up with these side-trips from Helsinki: Sipoonkorven Kansallispuisto (in Vantaa) and Espoo (Nuuksio National Park, Kaitalampi, & more). Pack the 17th (Sat) with family-friendly diversions at Linnanmaki Amusement Park. There's much more to do: wander the streets of Katajanokka, relax and rejuvenate at some of the top local wellness centers, get engrossed in the history at Seurasaari Island and Open-Air Museum, and get to know the fascinating history of The Esplanadi Park. To see reviews, other places to visit, maps, and tourist information, refer to the Helsinki trip itinerary planner. You can drive from Loviisa to Helsinki in 1.5 hours. Expect a daytime high around 24°C in August, and nighttime lows around 13°C. Finish up your sightseeing early on the 26th (Mon) so you can travel back home.